A cigar, strictly speaking, is a bundle of dried and fermented tobacco leaves that are tightly rolled into various types and sizes. One end is then cut and ignited, allowing smoke to build up and be drawn into the mouth. The tobacco leaves are “cured” which can take anywhere between a month to a month and a half. The leaves are aged using both heat and shade to reduce their sugar and water content. The leaves are then “fermented”, which is a process that allows the leaves to dry properly without rotting. It is in this process that the flavours, aromas, and burning characteristics are brought out in the leaf. Once the leaves are aged to the makers satisfaction, they are then selected to be either a “filler” or a “wrapper”- depending on their appearance and quality. During the process of differentiating the leaves, they will continue to be handled with care and inspected carefully to ensure that they age properly. The best cigars in the world are hand rolled. 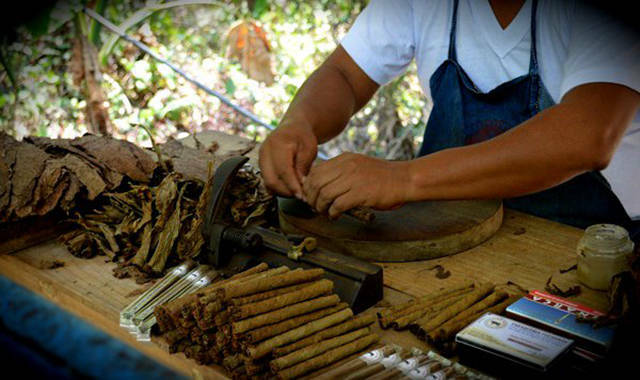 A skilled roller has the ability to roll several hundred identical, high quality cigars per day. The roller will ensure that the leaf they use to wrap the cigar with remains moist. 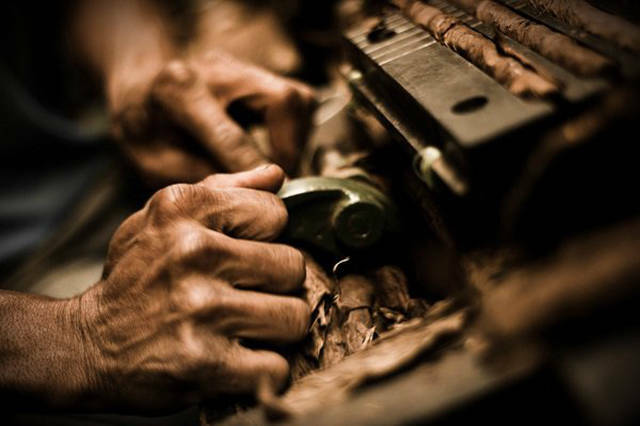 Once wrapped, the cigar is placed in a wooden form to dry while their uncapped ends are cut to a specific size. 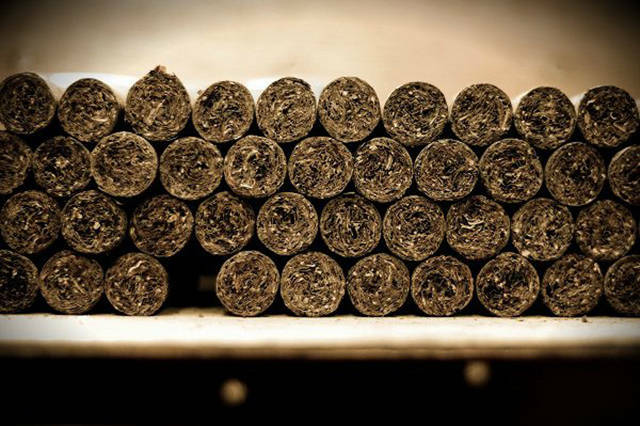 Cigars are typically composted of three different types of tobacco. The variations of which, will determine the kind of smoke you will experience. The outermost layer, is the wrapper. This is the most expensive part of your cigar. The characteristics and flavour is heavily determined by the kind of wrap used to bind it. The colour of the wrapper is determined by how it is grown and matured. Here are the most common colours of wrappers. Candela: Extremely light, almost green. Claro: A light, yellowish tan. Underneath the wrapper, you will find the “Binder”. The binder consists of filler leaves that sit beneath the wrapper. Cigars don’t only come in one standard shape. 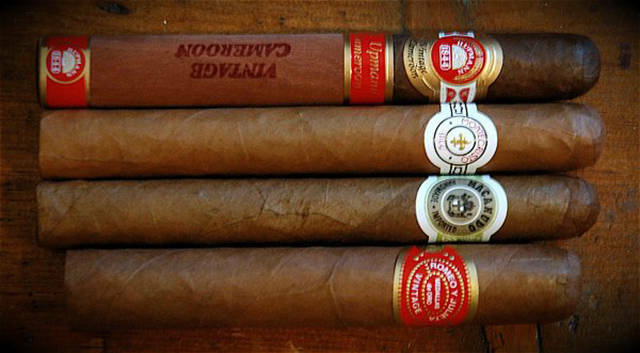 In fact, the size and shape is a very typical way of differentiating cigars. These are called the “Vitola” of the cigar. 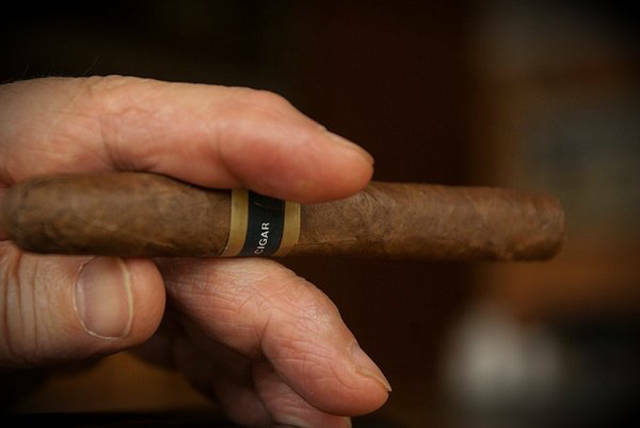 Cigars are measured by both the ring gauge and the length. These are straight sided cigars. They typically have one open end, and a “capped” end which needs to be cut off before smoking. Parejos come in plenty of different sizes and shapes, such as The Churchill (after Winston), Corona, Petit Corona, Robusto, and Double Corona. This classification of cigar consists of any cigar that isn’t completely straight. 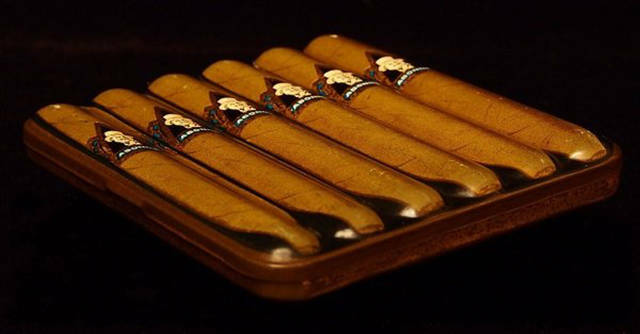 A few types of Figurado cigars are Pyramids, Belicosos, Torpedos, and Perfectos. When you buy cigars that you are planning on keeping for a while, you want to be sure they are stored properly. 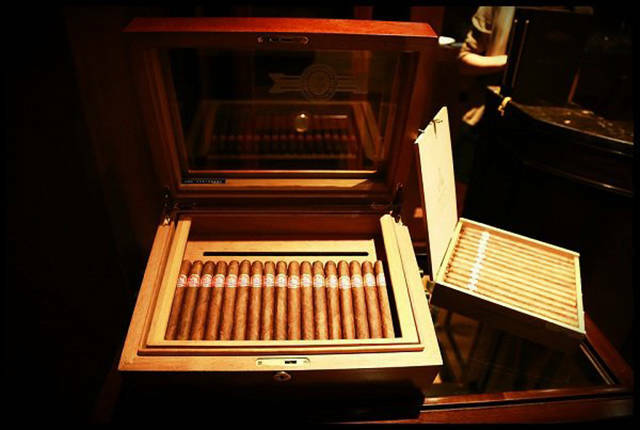 A humidor is the ideal accessory for helping maintain their flavours. Ideally, you want to keep the humidity at 65–70%, and the temperature at about 18 °C (64 °F). This also affects the burning of the cigar. If the cigar is dried out, it will burn faster and harsher. 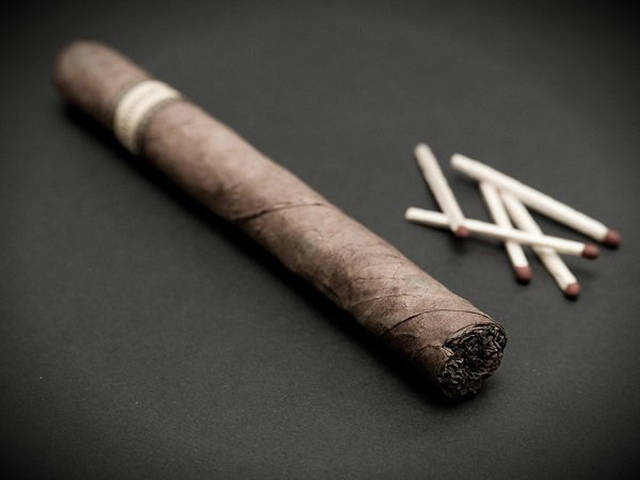 Conversely, a damper cigar will burn unevenly and even present an acidic flavour. Most cigars will come with a “cap” at one end. In order to smoke the cigar properly you need to be sure you cut the cap off. This is where a cutter comes in handy. Make sure that you have the cutter placed on the right spot, then in a quick motion, snap the ends shut. 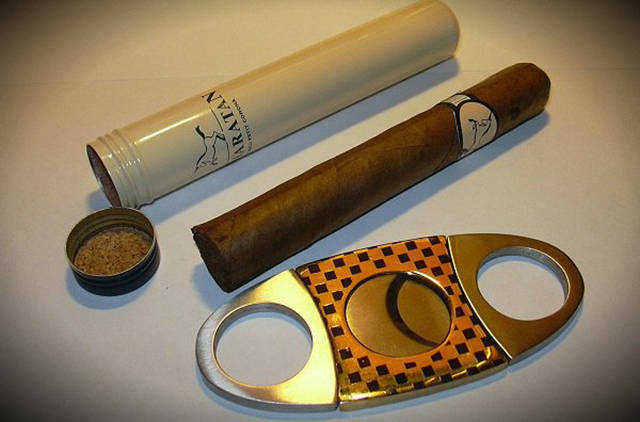 There are three basic types of cutters used for cigars: The Guillotine, Punch Cut, and V-Cut. First, you need to understand which end is which. The head of the cigar is typically closest to the band. The foot, is the end that you light. The best option is to use a torch lighter. However, wooden matches work perfectly fine. Cigarette lighters should be avoided as the flame tends to f*ck with the flavour of the cigar. If you want to go old school with it, use a cedar spill. When lighting, be sure you are drawing at an even, constant pace, while rotating the cigar. Remember, most people choose not to inhale the smoke. Smoking a cigar is very much a patient smoking, as I mentioned earlier. The rate of which you smoke is completely up to you. Some people smoke at a puff a minute, some a bit faster, others a bit slower. 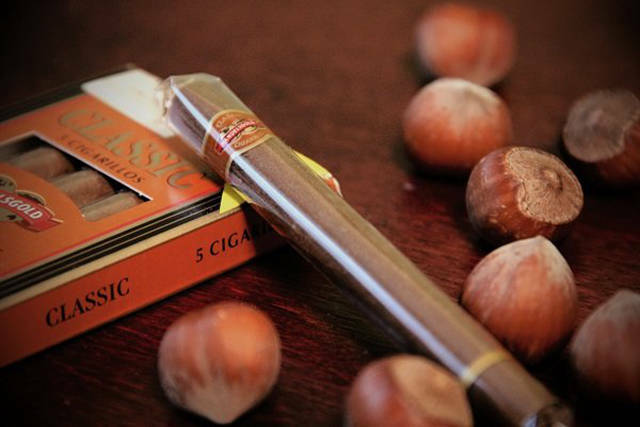 What you want to do is enjoy the flavours and aromas that you cigar presents you with. Relax, live in the moment, these things are made to be enjoyed. 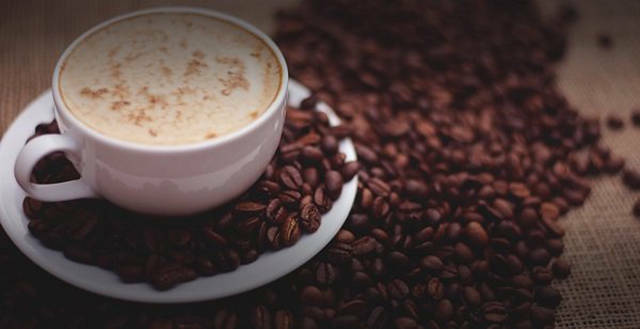 Coffee is a great drink to have with a cigar. 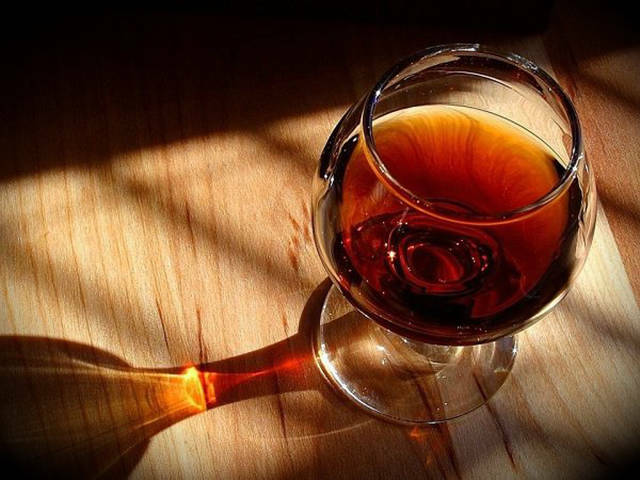 The drink not only warms your palette, but it enhances the flavours you taste. 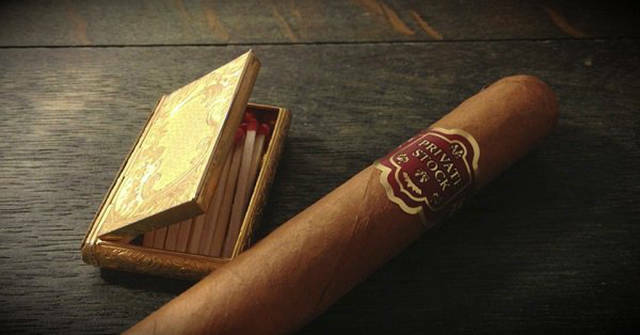 If you are slightly more daring, a nice brandy or scotch goes extremely well with a cigar. You want to be sure that you choose the right combination of cigar and liquor, so that they complement each other and pair nicely. This enhances your experience tremendously. Where and when do you smoke a cigar? Really, like anything, it’s all about your preference. Some people love to do it by a camp fire, others on their porch. It’s all about where you choose to experience it. Pick a place that is comfortable, and allows you to sit and relax for a little while. 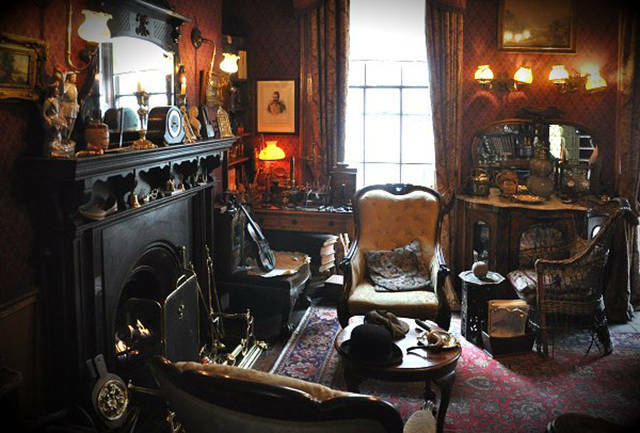 Ideally, you would have access to some nice music, a comfy place to sit, and a table to keep your drinks and anything else you might want to have with you. 2 responses to "Things That Every Cigar Lover Should Know About Cigar Smoking (14 pics)"